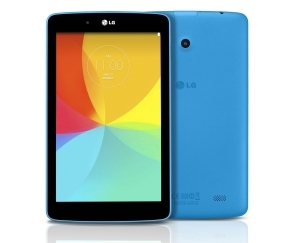 7-inch HD+ IPS Display: 7-inch HD+ IPS display uses Zero Gap technology for wide angle viewing, so it’s easy to share the tablet with a friend while watching a movie or playing a game. 5 Megapixel Rear-facing Camera: 5 megapixel rear-facing touch and shoot camera takes vibrant photos of your favorite candid moments. 4000 mAh Battery: 10 hours of usage with the 4000 mAh battery, enables you to use the LG G Pad throughout the day. AT&T continues to strengthen its position as a leading tablet provider by offering you a wide selection of tablets on the nation’s most reliable 4G LTE network. For more on the LG G Pad 7.0 LTE go to www.att.com/gpad7lte.